A LAST-gasp strike from Steven Brown sealed a dramatic victory for Crumlin Star over Oxford United Stars in Saturday’s Irish Cup Fifth Round tie at The Cliff on Saturday. The Ardoyne men seemed to be coasting when a Ciaran Murphy double had them leading 2-0 after 67, but the Derry side fought back and star striker, Kyle Curran netted twice to seemingly send this game to extra-time, but up popped Brown at the death to seal a Sixth Round encounter with Carrick Rangers. It was a strange game with the first half forgettable, but really came to life in an action-packed second period. “The first half we didn’t show up,” said a delighted Crumlin Star manager, Sean Brown after. “At half-time I let them have it a bit because that’s not the game we play. In the second half we came out and showed that. Indeed, there was little to write home about in the opening 45 minutes with a third minute header from Ciaran Murphy that cleared the crossbar the closest they would come to opening the scoring. The North Belfast men controlled the play in the early stages, but Oxford grew into proceedings and had a couple of half chances of their own with Michael McCann’s glancing header from a Lee Roddy free-kick going outside the post and then Brian Rainey had an effort that landed on the roof of the net. Star had an appeal for a penalty waved away when Mark Mooney went down in the area, but there was little else to warm the two sets of supporters up as the sides went in at the break at 0-0. It was clear from the start of the second half that both sides were intent on going for it a little bit more as the pace of the game increased and on 54 minutes, Star had a chance when Steven Brown cut the ball back into the path of Paul McLarnon, but the captain’s shot shaved the top of the bar. The North Belfast man continued to pile forward and Gerard Campbell’s curling shot from the right that seemed destined for the corner of the net was deflected out for a corner by Oxford goalkeeper, Kevin Mulchay. At the other end, the Derrymen thought they had taken the lead on 59 minutes when from a corner, the ball eventually broke to Emmett Hargan who shot for goal, but the ball was cleared off the line by Brown. A minute later and the deadlock was broken with Star taking the lead. Brown made a good break up the right wing, crossed to Anthony Burns whose shot was smothered by Mulchay, but the ball broke kindly to Ciaran Murphy on the left of goal who steadied and guided it high into the net to send the Star players and management into raptures. Seven minutes later and the Ardoyne men doubled their advantage. This time a long ball from the left seemed to be easy to deal with by the Oxford defence, but Kevin Roddy and Michael McCann both went for it, collided and the ball fell to Murphy who cooly picked his spot and fired low into the net to make it 2-0. The North Belfast men almost wrapped it up on 70 minutes when the impressive Barry McKervey unleashed shot from distance that seemed to be heading into the top corner, but Mulchay made a stunning save and a minute later, Anthony Burns saw his effort on the turn go narrowly wide. However, on 72 minutes the visitors gave themselves a lifeline when Lee Roddy clipped in a pass to Kyle Curran who controlled well and finish ed well past Ciaran McNeill to make it 2-1. This gave Oxford hope and they really started to look for the equaliser and it arrived on 79 minutes when a long ball took a nick of a Crumlin Star head and fell to Curran who made no mistake. It was now all to play for and while United had a shot from Curran saved, Star were the side who were piling on the pressure although they were finding it hard to create an opportunity. This was to change on 89 minutes however, when McKervey’s corner from the left broke who Steven Brown outside the box and the right winger did brilliantly to get over the ball and guide it into the corner of the net for the winner. There was still time for some drama when Crumlin substitute, James Doyle – who had just been on the pitch for a matter of minutes – was shown a straight red card by referee, Ken Gibbons after a tangle in the corner, but there appeared to be little in the incident. 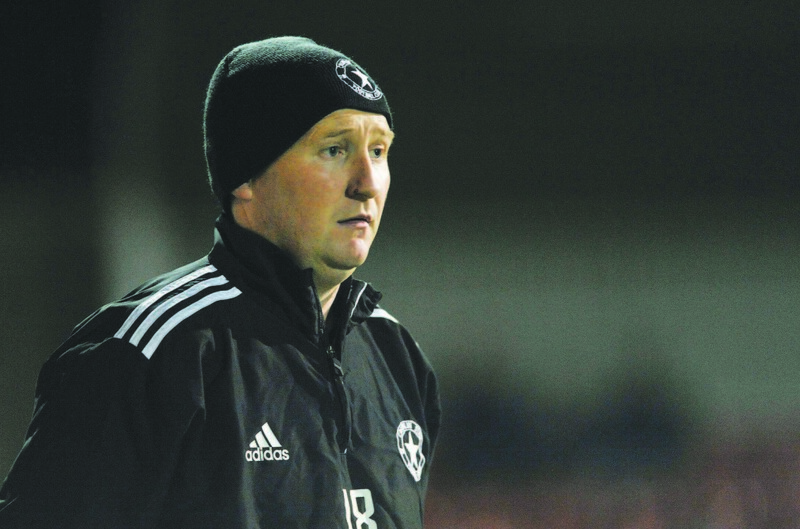 This was to have no impact on the outcome of the game however as time was virtually up and Star celebrated a thrilling victory that sees them move into the last 16 when Premiership opposition in Carrick Rangers await. “My wee cousin gets the first two and my brother scores the winner,” revealed a delighted Sean Brown after. “Their striker was pretty tasty and scored two. It’s no longer a replay, but extra-time and penalties in the cup, so we are delighted to have got the winner and to get into the Sixth Round. “It was all about winning and we won. We did do it the hard way in fairness, but we are through.” On the Doyle incident, Brown says he didn’t feel a red card was justified, but is hoping the referee’s report is not too damning of his player. “The referee said to me at the end that the linesman told him he (Doyle) led with the head,” he stated. CRUMLIN STAR: C McNeill, G Campbell (C McDowell 80), A McNeill, G McKernan, P Berne, P McLarnon, S Brown, M Mooney, A Burns (J Doyle 90+2), C Murphy (P O’Neill 90+4), B McKervey. Goals: C Muphy (60, 67), S Brown (89).